Stairwell 2 is particularly interesting because all the stores on the first floor that are connected to corridor 2 use a stairwell leading up as a means of egress! All stores had a front entrance, and a back entrance, corridor 2 was on the side of the mall that was 1 story below the ground elevation (the north side of the mall is at ground level, the south side is at the 2nd level). 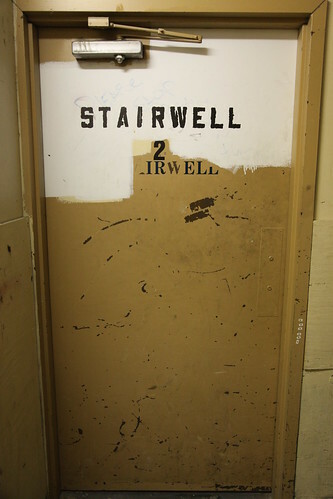 Since there was no ground-level exit on the 1st floor on this side, exiting through a store's employee-only / emergency rear door meant climbing a flight of narrow stairs to the 2nd floor, then navigating the serpentine corridors until finding an exterior door.